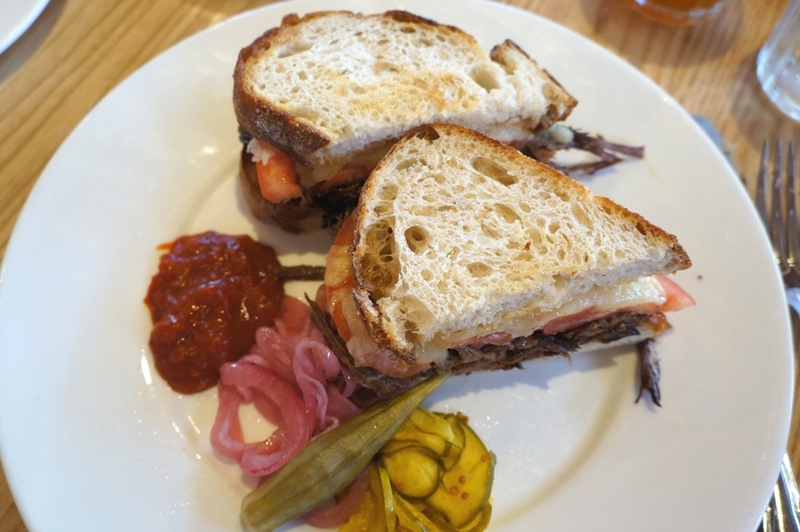 Having enjoyed Yardbird so much for brunch, we dropped by a second time during our Miami trip (read about my first visit here). This time we came for lunch which is served Monday to Friday between 11:30am and 3pm. Similar to the brunch menu, the lunch menu is separated into several sections – small shares, salads, sandwiches/larger plates and fixin’s. They have a selection of sweet teas which come in blackberry, strawberry, peach or passion fruit. I tried the Peach Flavoured Sweet Tea ($4) which wasn’t actually too sweet despite its name. 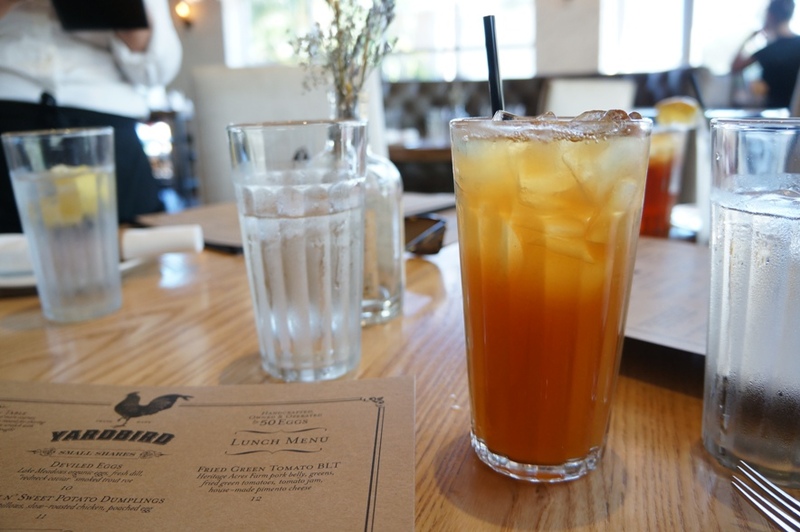 Given Yardbird’s extensive selection of bourbon and bourbon cocktails, we decided to try the Southern Revival – Buffalo Trace Bourbon, basil, passion fruit, lemon juice and ginger ale ($11). 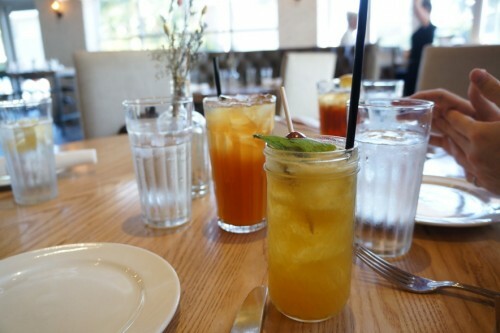 It was light, refreshing and really delicious! It didn’t taste like the heavy bourbon cocktails I’m used to and was a great drink to go with our lunch. 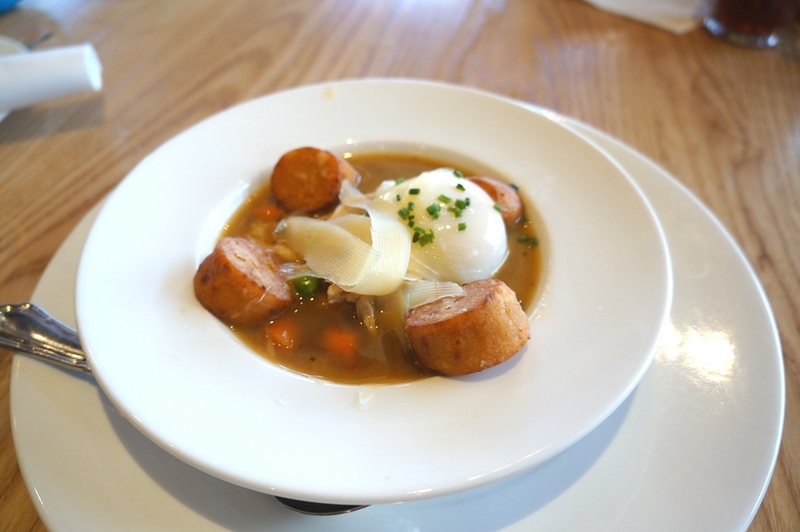 We started off with the Chicken N’ Sweet Potato Dumplings – sweet potato pillows, slow-roasted chicken and poached egg ($11). It actually came in the form of a soup. The sweet potato dumplings were light and fluffy but not particularly memorable. The broth was what really stood out for me. I would’ve been quite happy with a bowl of this alone. 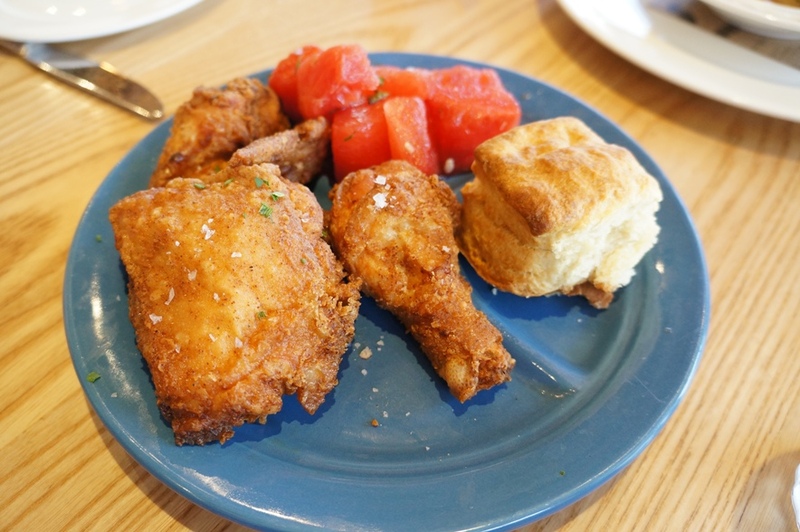 Now, onto what we came here for, Llewellyn’s Fine Fried Chicken – three pieces, citrus pepper watermelon and house-made buttermilk biscuit ($14). If you’re here for lunch, the fried chicken comes in the form of a “Blue Plate” special. The menu actually indicated that the special comes with two pieces of chicken but today it came with a drumstick, wing and thigh. I prefer dark meat, so I didn’t miss the breast. The fried chicken was just as good as I remembered. Still the best fried chicken I’ve had! 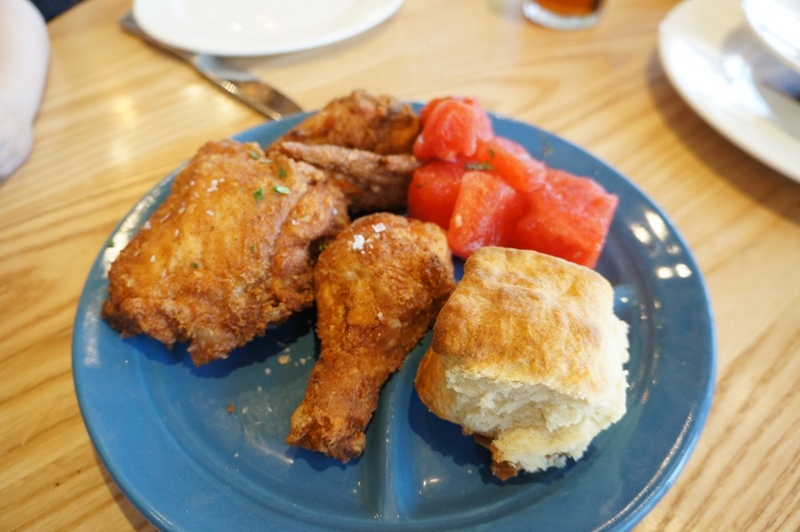 It came with a light, fluffy biscuit and a refreshing watermelon salad which was the perfect accompaniment for the fried chicken. We also shared the Smoked Brisket Sandwich – signature pickles, house-made ketchup, melted swiss cheese and grilled country bread ($15). 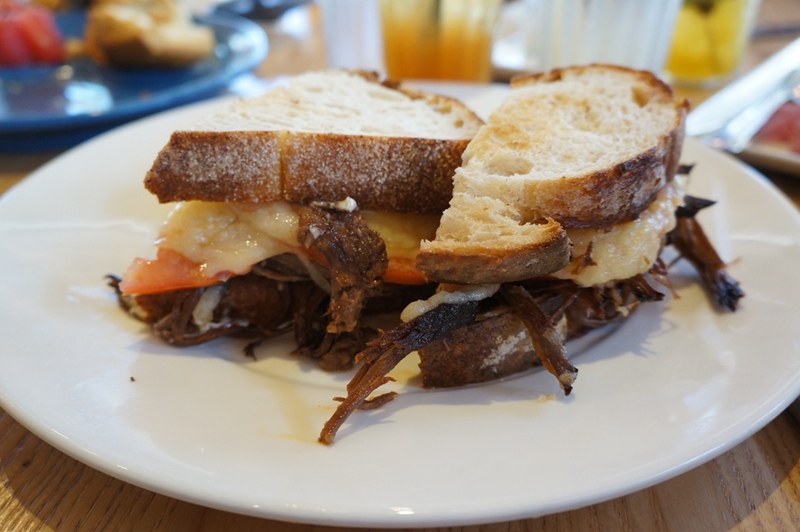 They were very generous with the pulled brisket they stuffed in the sandwich and the combination of the country bread, meat, cheese and tomatoes was delicious. 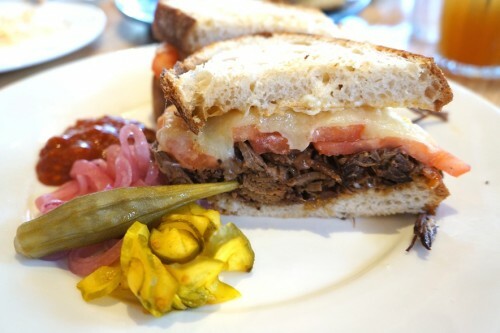 It came with a side of pickled onions and putting some in the sandwich really elevated it. Oh and the house made ketchup was fantastic. Expect a messy sandwich! 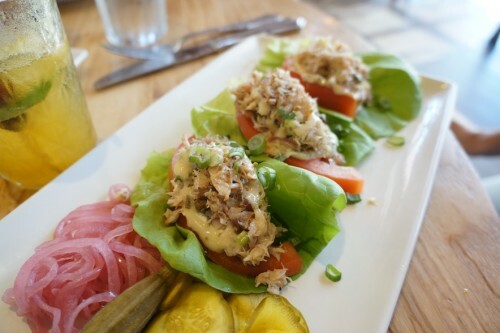 For something a little lighter, we ordered the Crab Salad Sammy – with lemon dressing on a lettuce wrap ($15). It typically comes on bread but after the fried chicken and smoked brisket sandwich we opted for the lettuce wraps. 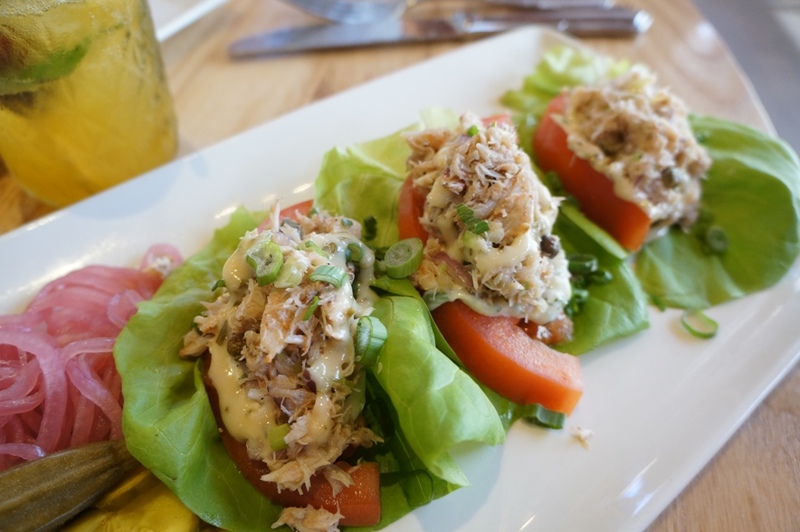 The crab was fresh and the lemon dressing didn’t overpower it at all. The crab was definitely the star in this dish. 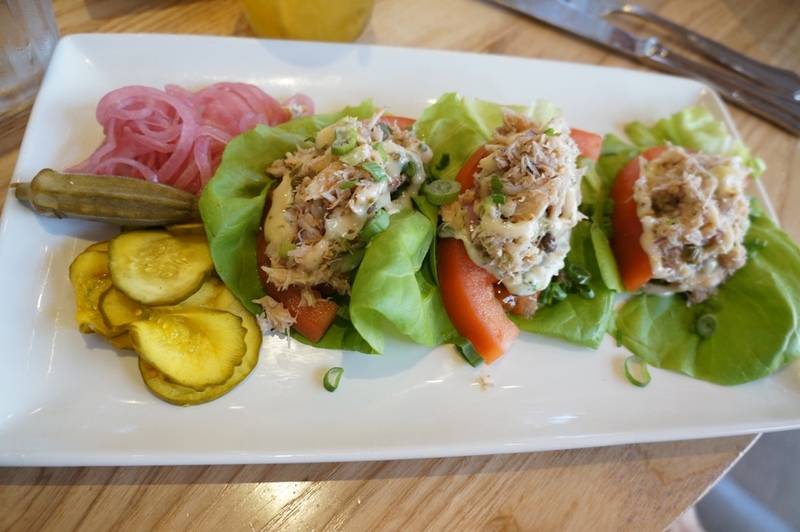 Like the sandwich, it came with a side of pickled onions – make sure you get some of it into each wrap. Highly recommended if you’re looking for a lighter dish. 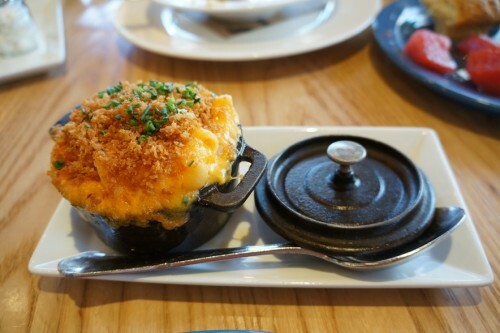 Last but not least, we had to try the Macaroni & Cheese – Torchio pasta, 5 artisanal cheeses and crispy herb crust ($9). After seeing how amazing it looked when we were here for brunch, we knew we had to order it on our next visit. They used a bigger type of pasta here than macaroni which allows you to get more of the cheese in each bite. If you like your mac & cheese very cheesy , then this is right up your alley. But who am I kidding…who doesn’t like it extra cheesy? All topped with a flavourful herb crust, it was a killer mac & cheese. On my first visit, I vowed to save room for dessert on my next visit. Needless to say, after all the food we ate, dessert didn’t happen. But you just wait…I’ll be back!